Former FBI Director James Comey told an audience at the Hewlett Foundation's Verify Conference that he has "no idea what the heck he's talking about" - adding that "The FBI conducted court-ordered authorized surveillance. I don't consider that spying."
. @Comey, at the Hewlett Foundation's Verify Conference, says of Barr's "spying" comments: "I have no idea what the heck he's talking about." More @Comey on Barr's "spying" comments: "The FBI conducted court-ordered authorized surveillance. I don't consider that spying." Barr admitted on Wednesday during congressional testimony that the Obama administration 'spied' on President Trump - a claim which he has vowed to investigate. "I think spying did occur," said Barr during a Senate Appropriations subcommittee hearing - expanding on comments made the day before. "But the question is whether it was adequately predicated and I’m not suggesting it wasn’t adequately predicated, but I need to explore that." Barr says he believes Trump's 2016 campaign was spied on. @brianschatz: "Do you wanna rephrase ... I think the word 'spying' could cause people in the cable news ecosystem to freak out." 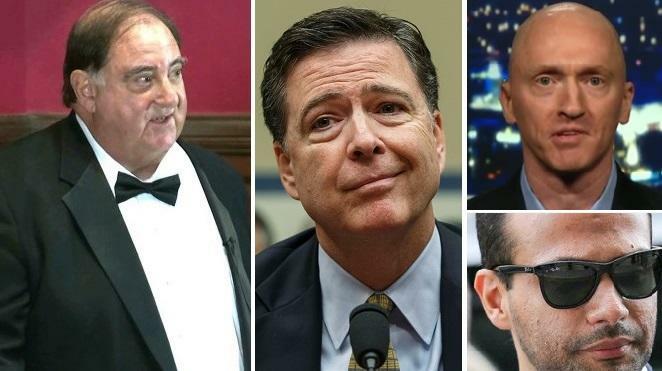 We know about the Carter Page FISA warrants - but did a court authorize the Obama administration's use of longtime spook Stefan Halper to infiltrate the Trump campaign and surveil both Page and aide George Papadopoulos? And why was Halper paid hundreds of thousands of dollars by the Obama Defense Department? Comey added of Barr: "I think that his career has earned him the presumption that he will be one of the rare cabinet members who will stand up for things like truth." When asked if the FBI might have done anything differently going back to 2013 in preparation for 2016, Comey said "Going back to 2013, can I decline to accept the appointment of FBI director?"
. @Susan_Hennessey asks @Comey what the FBI might have done differently going back to 2013 in preparation for 2016. "Going back to 2013, can I decline to accept the appointment of FBI director?" Comey jokes. And who could blame him based on all the money he made before entering public office! Prior to heading up the FBI, Comey earned $6 Million dollars in one year as Lockheed’s top lawyer – the same year the over-budget F-35 manufacturer made a huge donation to the Clinton Foundation. He was also a board member at HSBC shortly after (then NY AG) Loretta “tarmac” Lynch let the Clinton Foundation partner slide with a slap on the wrist for laundering drug money. Lastly, when asked by MSNBC's Natasha Bertrand about the Thursday arrest of WikiLeaks founder Julian Assange - who reportedly scuttled a deal with WikiLeaks for Assange's testimony in the Russia investigation in exchange for redactions in the "Vault 7" document dump.